Searching for a restaurant in Greater Manchester? There are lots to choose from in Manchester city centre, Chorlton, Didsbury, Stockport and throughout the area. With a range of cuisines from Italian to Indian and British, the variety of places to eat in Greater Manchester with its restaurants, bars and pubs is huge. Find the right place to eat in Manchester with Sugarvine. Available from 4pm - 8pm Sunday to Friday. Enjoy a Traditional or Savoury Afternoon Tea at The Point for £18pp (or £34 for two). Available from 2pm-5pm Monday to Friday, advance booking only. Every Wednesday and Thursday will be half price steak night in Plantation. 10oz Rump Steak will be just £6.50, 10oz Rib Eye will be £8 and 10oz Strip Loin will be just £8, all steaks are served with skin on fries and home made onion rings and garnished with herbed butter, sautéed mushrooms and onions. 1 Piri whole chicken, 5 Piri chicken wings, Chips, Salad, Coleslaw, 1 can of Pepsi, £9.95. Weekdays only. Sunday Lunch: 1 course, £13.95; 2 courses, £16.95. Served 2pm-7pm with menu changing weekly. Steak Night every Wednesday. Get two 10oz sirloin steaks with fat chips and grill garnish plus a bottle of house wine for only £39.95. Available Wednesday 5 - 10pm, Thursday & Friday 12 - 10pm. Freshly made soup and panini - £6.95 eat in, £5.95 take away. From 3pm - 7pm on all classic menu. Two classic cocktails for £10. £24.95 pp includes a FREE glass of Prosecco. Upgrade to Champagne and make it just £29.95. Two-course lunch for £11.50, served 12pm-3pm, Monday to Saturday. 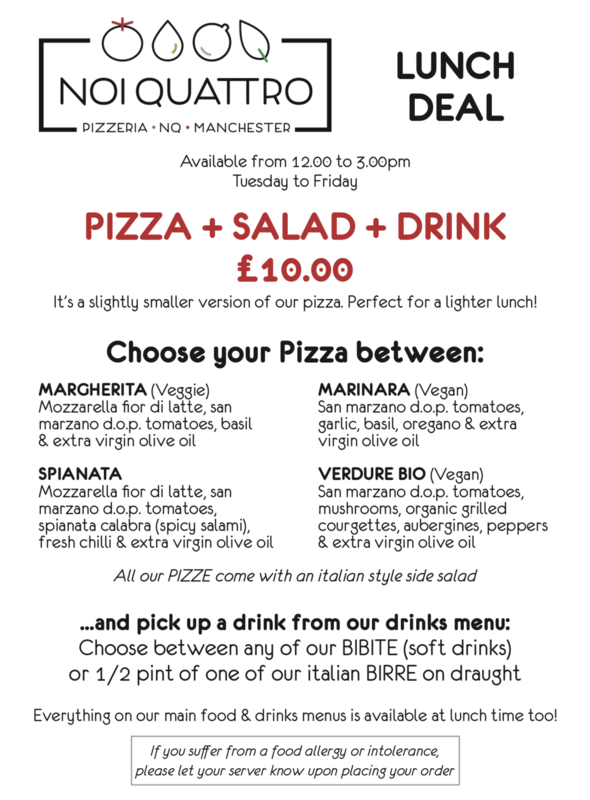 All you can eat Pizza, £9.95pp. Available every day from 6pm to 10pm. Available all day every day for students. 2 courses for £16.95, food and choices for the pre theatre menu ( up to 6.45) very good with enough choice for starter and main service great. The drinks a were a bit expensive £30 for 4 drinks, small prosecco a bottle of Bud, a medium glass of red wine and a gin and tonic . The whole meal with tips cost us £83 it soons adds up Don't like the idea of 10% service charge added to the bill you can ask to remove it, I like to leave a tip in restaurants for good service etc and expect that restaurants pay their staff a reasonable wage which does not rely on tips. Overall good meal and atmosphere and service also close to the Bridgewater Hall theatre but might try somewhere else that doesn't automatically add 10%service charge.